HR Milner Generating Station ("HR Milner") is a 150 MW dual fuel power station located near the town of Grande Cache, Alberta. HR Milner has been in operation since 1972 and is owned by Maxim Power Corp. ("MAXIM"). The station provides voltage support to Alberta’s transmission grid and employs ~50 full time employees. The station provides voltage support for the northern part of Alberta’s transmission grid utilizing two 25 kV and two 144 kV transmission lines. The single unit is dual fuel (coal and natural gas) with a unique balanced draft Babcock & Wilcox downshot fired boiler, which was designed to burn by-product coal materials. 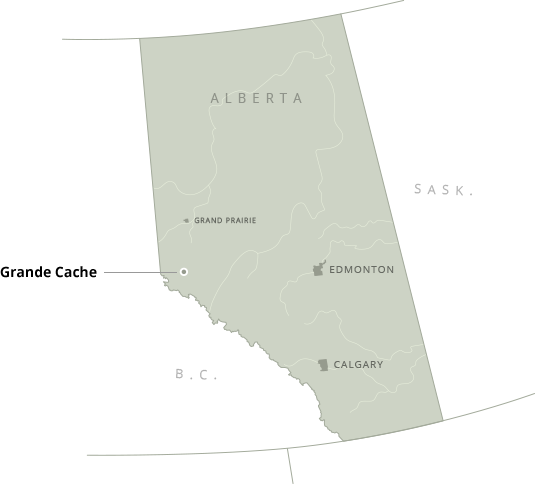 The power produced by the unit is sold both on the spot market through the Alberta Power Pool and through bilateral marketing arrangements as appropriate. Situated in the Smoky River valley approximately 20 kilometers north of Grande Cache and about 445 kilometers west of Edmonton, HR Milner is important to the local economy of the region providing employment to ~50 full time employees. The Grande Cache - Milner area is located in the Rocky Mountain Foothills physiographical region, which is typified by rugged topography. Construction of HR Milner began in 1969 by Canadian Utilities, Alberta Power’s parent company, and was commissioned in 1972. Since 2000, the facility was operated by ATCO Power (2000) Ltd. under an operating agreement with the Alberta Balancing Pool. On October 30, 2003, the Milner Power Limited Partnership (“MPLP”), a consortium headed by MAXIM, entered into a binding Asset Sale Agreement with respect to the purchase of HR Milner from ATCO Power (2000) Ltd. and the Balancing Pool with final closing announced on January 29, 2004. MAXIM subsequently completed the acquisition of MPLP from its partners in 2005. Milner Power Inc. is the General Partner of MPLP and is responsible for managing the affairs of MPLP. Hitachi: 150 MW, 11 stage, condensing, non-reheat turbine. Inlet steam at 510°C (950°F) and 8.8 Mpa (1265 psia). Hitachi: Alternator rated at 166,667 kVA, hydrogen-cooled. Babcock & Wilcox: Downshot, dual fuel (coal and natural gas), balanced draft with designed capacity of 612 tonnes (1,350 kpph) with superheater outlet conditions of 8964 kPa (1300 psia) and 513°C (955°F). The boiler is equipped with two Riley double-ended ball tube mills. Bottom ash is sluiced to dewatering bins and is then hauled by truck to an off-site ash storage area. Fly ash is transferred to a fly ash silo and is then hauled by truck to the ash disposal area. The non-reheat configuration has a feedwater cycle that consists of three motor driven boiler feed pumps, two low-pressure heaters, a de-aerator, and two high-pressure heaters. The condenser (with stainless steel tubes) cooling is provided by circulating water from a fourteen cell mechanical draft cooling tower. Makeup water comes from the Smoky River adjacent to the site. Particulate removal consists of a Flakt pulse jet fabric filter (baghouse). Milner Power Inc. recognizes its responsibility for cooperation, communication and consideration of community values. This includes engaging in ongoing and open communication to understand and address any concerns or issues brought forward by all of our stakeholders. 1210, 715 - 5th Avenue S.W. Maxim Power Corp. ("MAXIM") is an independent power producer which acquires or develops, owns and operates innovative and environmentally responsible power and power related projects. MAXIM currently owns and operates one power plant in Alberta, having 150 MW of electric generating capacity. In addition, MAXIM has four permitted power projects in Alberta with 980 MW of generating capacity. MAXIM trades on the TSX under the symbol MXG. ©2019 Milner Power Inc. All rights reserved.